Kars4Kids Reviews - Is it a Scam or Legit? 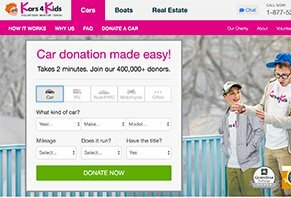 By cutting out middlemen, the Kars4Kids charity makes donating your car, RV, boat, personal watercraft, motorcycle—just about any vehicle—fast, easy, and completely free. All you have to do is take two minutes to fill out an online form or call direct, and your vehicle can be picked up within 24 hours, regardless of the state you live in, or the state of your car. But Kars4Kids isn’t all about cars; they can also accept donations of cash, real estate, life insurance, and more. Regardless of how you do it, by donating to Kars4Kids, not only will you help “build a complete child,” but you’ll also save money on your taxes and receive a voucher for a two-night, three-day hotel stay at 50 locations across the US. And all of it happens without paperwork, headaches, or cost to you. Taken together, this is why Kars4Kids is one of the largest car donations charities, with 400,000+ donors to date. There’s little doubt that charities like Kars4Kids do meaningful work and make a difference in thousands of children’s’ lives. But if you have a vehicle you need to donate, is Kars4Kids necessarily your best option? In this review, we’ll help answer some of your most important questions. To begin, we’ll take a closer look at the charity. Just Who Is Kars4Kids, Anyway? Based out of Lakewood, NJ, Kars4Kids is non-profit charity organization “dedicated to addressing the educational, material, emotional and spiritual needs of Jewish children and their families” since 1995. In a nutshell, Kars4Kids’ network of 1,650+ nationwide mentors and volunteers help children succeed in life by fostering positive experiences in a child’s school, friends, community, and family. Youth Development – Summer meal programs, 40+ ChillZone locations, summer camp, extracurricular programs and youth groups, and volunteer leadership development. Educational Services – School placement and tuition assistance and afterschool learning. Community & Family Outreach – Family holiday retreats, charity distributions, cultural activities and community outreach, small grant initiatives, and public service campaigns. In the next section, we’ll learn how Kars4Kids takes donations. Using their online form. Simply enter the vehicle type, year, make, model, and mileage, and indicate if it’s running and if you have the title. After clicking the Donate Now button, you’ll need to enter your name and contact info. Whether your vehicle is running or not, after speaking with Kars4Kids, they’ll arrange to have a local, professionally licensed, bonded, and insured towing company contact you within a few business hours. From there, your vehicle will likely be picked up within 24-48 hours thereafter (or faster, if necessary), regardless of the state you live in. All of this occurs without any cost or hassle to you, and you don’t even have to be home during pickup. Just remove any personal belongings and leave the key and title under the dashboard, and you’re good to go. The towing company will provide you with a temporary receipt, which will include you car’s information, along with the charity’s name and phone number. Within two weeks, you’ll also receive your tax-deductible receipt and hotel voucher. Speaking of which, let’s briefly talk about Kars4Kids vacation voucher next. What Does Your Kars4Kids Voucher Provide? Through their partnership with Vacation Breakaway, all vehicle donations to Kars4Kids will receive a hotel voucher along with your tax-deductible receipt. This involves 50 different locations throughout the US (According to the charity, “The hotel destinations offered in this program are of similar quality to the Choice Hotels brand and La Quintas.”), although this doesn’t include taxes, airfare, or other transportation, and there are some other conditions. You’ll also have to send in a $50 refundable deposit within 30 days. Now that we’ve covered all the basics about Kars4Kids, let’s see how it stacks up against other similar car donating charities. In this section, we’re going to look at Kars4Kids from two different perspectives: national charity watchdog groups and individuals who donated to the charity. Whenever you’re researching a charity you’re thinking about donating time or money to, it’s always a good idea to check out industry websites that rank charities based on key factors like financial performance (how much of each dollar goes to children, for example), accountability and transparency, and more. According to their 2014 filing, Kars4Kids brought in about $34.7 million, with about $3.9 million remaining after expenses. With this in mind, Charity Navigator gave Kars4Kids an overall rating of 2 stars, with just 1 star for financial (about $0.47 of every dollar actually goes to the charity’s programs, while $0.48 goes toward raising more money), but 5 stars for accountability and transparency. Speaking of which, CharityWatch.com wrote a fairly detailed article about Kars4Kids (and their related charities, JOY and Oorah) in 2010, claiming that JOY spent $118 in advertising costs for each car donated, although each vehicle only sold for an average of $400. In addition, the article mentions that the free hotel vouchers were basically just tickets to timeshare presentations. Did we find any of the charity’s clients saying the same thing? On the other hand, Kars4Kids had a 99% approval rating on Feefo.com, where most clients claimed the process was fast and easy. Most complaints (what few there were) seemed to reference delays obtaining paperwork post-donation. Kars4Kids also had a 3.5-star review on Yelp, based on 13 individual reviews. Again, most compliments referenced the easy process, while most complaints reference processing/paperwork problems. Finally, there were dozens of Kars4Kids complaints on ComplaintsBoard, which referenced everything from who the charity’s money benefits to problems receiving paperwork. Should You Donate Your Car To Kars4Kids? There are probably dozens (if not hundreds) of different personal factors that might go into choosing one charity over another, such as ease of doing business, recommendations from friends or family, the charity’s overall mission, financials, and much more. And each one of these factors will weight differently for all of us. In general though, CharityWatch’s Tips for Donating a Car to Charity recommends you look for an organization that minimizes the use of middlemen, which is exactly what Kars4Kids claims to do. However, to maximize your deduction, they recommend donating it to a charity that uses the vehicle in their operations or who donates it directly to an individual, which is not something Kars4Kids does. Otherwise, you might get less than fair market value. To make sure you get the most return on your gift (again, as we talked about at the beginning, assuming this is your ultimate goal), you might want to search online for other car donation organizations around the country, which support a variety of causes. For more information, you can also check out the IRS’ Donor’s Guide to Vehicle Donation, as well as Kars4Kids’ tax filing tips. Both my parents passed away, within four months of each other, and left behind a 2006 van that smelled of urine from my mother's numerous accidents. The van was filthy. The front end was damaged from the wreck my dad had two weeks prior to his death. I tried to sell it for parts but no takers. I filled out the Kars4Kids form online and they picked it up within 24 hours. 48 hours after they picked it up I had my tax receipt for $500 and the vacation voucher. Couldn't ask for anything better than this service. If you've ever been stuck in this type of situation, you will appreciate how helpful it was to have it off my hands. I filled out the online stuff, a few days later they came and picked up the Toyota Van I was donating. This was in September 2018. I waited a month, no word, I called them, and they stated it hadn't been auctioned yet. It finally did sell or auction or whatever and I only got an $850.00 write off for it. So, OK, I won't deal with them again. At the end of the year, I get a notice from the police department and court in lower Michigan, five hours away, that the vehicle had been abandoned and I am on the hook for it. I am still dealing with this dilemma as I am writing this review and will have to put in the time in an effort to hopefully remedy this situation. I'd give less than one star if I could. If you are looking for a maximum tax deduction, don't go this route. They didn't even get close to market value of my donation of a 1996 280 Larson Cabrio. I do not consider this company to be an honest company based off of trying to help kids when they don't start a bid close to the market value of a donation. Getting a tax write off for $1,900 vs. if we would have sold it ourselves and given the money to this charity for even $10k we would have been much better off (which would have been pretty easy to do where these boats with a 454 7.4 L engine is worth far more money then $1,900, let alone the lower unit refurbished is worth $4,500 and the trailer work about 1,500). So, if you really want to help the kids, sell your car, truck, RV, or boat first then give the money because the kids will benefit more from this then what kind of prices Kars4Kids could ever sell your donation for since they don't care what they get for your donation. Low ball price, where did the money go? I am very disappointed! This was a poor decision on my part to go with Kars4Kids. I will not be ripped off by them in the future. Please do not consider this organization for donating your car. Very poor service. I called their organization to donate my car and even filled it in online. It took more than 72 hours for them to tell me that none of their carriers are available. Also, when I tried to call them, the representative made me wait for 45 minutes. Worst service. Please consider donating to some other deserving organization! The company came when they said they would to pick up the donated car. I had to change the date a couple of times and they worked with me to arrange a convenient time. I was only given a value of $500 for tax purposes and after reading other reviews, seems like this is the value they are assessing most cars. Little disappointed with the limited tax deduction/value of car amount, but they were timely in picking up the car. I am not too sure about using the vacation voucher that was sent to me as there are quite a few restrictions/rules and have to give a $50 deposit. Probably will not use it. We moved from Damascus, Maryland in May 2017, and I couldn't take my 25-foot sailboat at that time. In the meantime, I bought another trailer that had 2 axles and not one like the one the boat was on. I called Kars4Kids, and they said they could take the boat trailer when I was ready. By the time I found another trailer it was fall and decided to bring the boat to Maine the next spring. In the meantime, I kept in touch with Kars4Kids. On May 7, 2018, Kars4Kids said they would arrange a local tower to pick up the trailer. After I arrived in Maryland, I texted Kars4Kids on May 15, 2018, and received a text stating that "unfortunately, we are unable to accept the trailer due to its insufficient resale value." I had to pay a salvage company $160 to have it towed. Had I known at least a day or two ahead of time, I could have arranged with a friend of mine to come and pick it up (for free) to sell for scrap metal. Kars4Kids gave me no advance notice, and I had to then move it immediately. After working with them for almost a year and then to have them change their mind with no advance notice is unprofessional and not good business. I would not give them any stars, but I have to give at least 1 to submit this. They picked up my car the next day. Worth about $1200, I was only able to write off $500. The vacation they advertise two nights free is a joke. I live in New Hampshire and they offered Salem or Dover, but there is nothing there. After all of the fees, they wanted me to pay $196 for a two-night stay in Dover. Again this is a joke. Write a Review for Kars4Kids!